This may seem straight forward, but this is one thing I've seen done wrong in 90% of games. How to apply hits and roll for saves. I've also come up with a very easy way to keep track of hits before you make saves. All this assumes we all know some what of how shooting works. What I'll start with is how to figure out what you need to hit. We all know, or should know, that this number is based on your opponents skill. But sometimes people forget that they are shooting at the entire platoon and not individual units. I saw this question come up on the FoW forum so I thought I would add it in. You only need to hit the easiest unit in the whole platoon you can legally shoot at. Look at the picture to the right. A Veteran Pioneer platoon is dug in and gone to ground. In addition they are over 16" from the IS-2's. Normally the Soviet tanks would need a 7 to hit. This is impossible. However, one of the pioneer teams has moved and is within 16". So, because of this the entire platoon can be hit with 4's. I now know I need 4's to hit, its time to roll dice. What I like to do (as do most others) is make sure I have 2 colours of dice. Lets assume the IS-2's moved and they want to shoot with their main gun because of the fire power test need to destroy dug in troops. 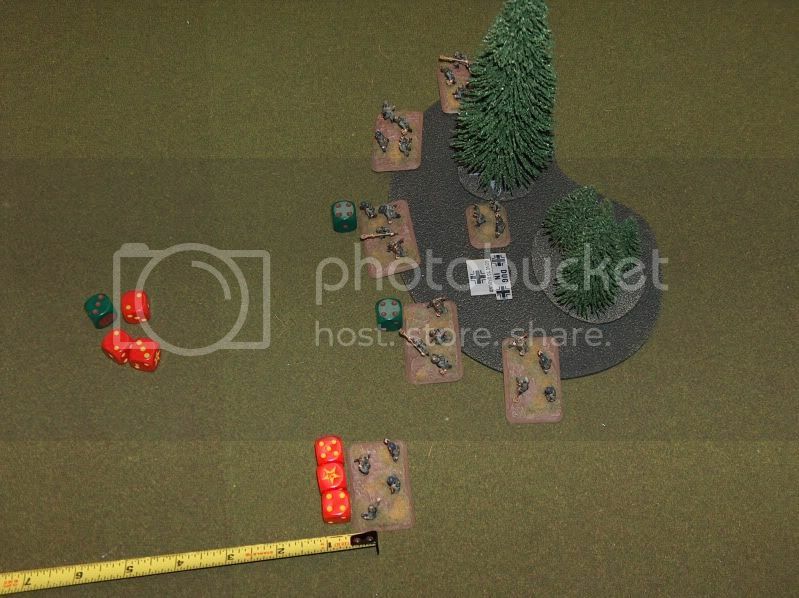 The tanks will then roll 1 main gun and 2 MG dice each. 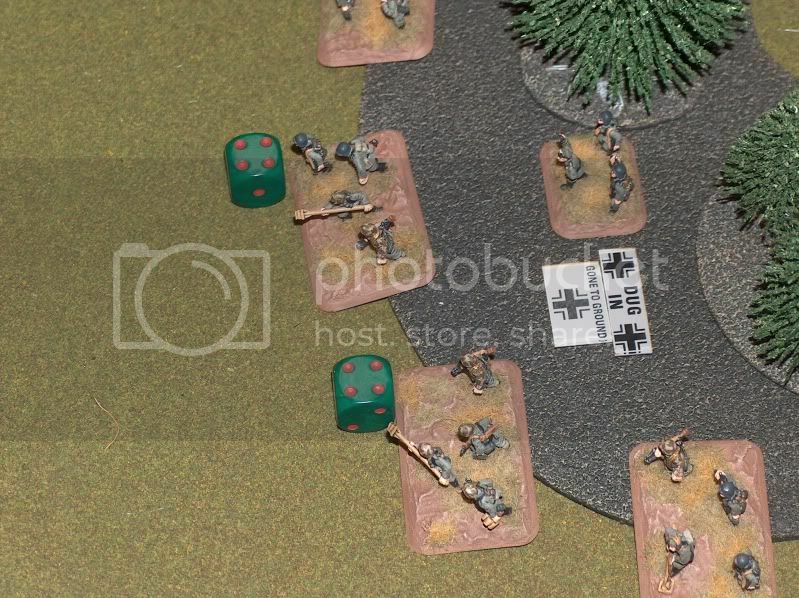 Roll one colour of dice for the main gun and one for the MG's all at the same time. ALL ONLY NEEDING 4's. Here is where the mistake happens. Because its the defender who applies hits, I find most people roll for saves and then pick which teams are dead. Incorrect-o, and yes it does matter. So, what i've come up with is the defender takes all the dice that are hits, and places them next to each unit that is to take a hit. You can see in the picture the 3 MG hits went to the unit within 16" because that is as far as the MG's can shoot. But the Main guns, get applied to 2 other teams. You can see on those dice that they still hit on 4's even though a 7 was technically needed for those individual teams. The one team has given away the platoons position. Now that you can see which teams are hit, the defender roll's saves for each team INDIVIDUALLY. Then you can take away the dice for that team. Or roll that dice if a fire power is needed. This works especially well if you are rolling a lot of dice or different kinds of weapons. Either the defender can't remember what hits he applied to what units or he is picking who dies after he saves. As I said this really matters, especially if different types of teams are hit or HQ teams. All to often defenders pick destroyed units after saves, and the HQ is the last unit to die. Even if you are guarding an object, and only 1 or 2 teams are in range to contest. The defender doesn't have a choice if these teams die or not...only if they get hits. And if there are enough hits for every team in the platoon, they have to take a hit. If those teams fail their save...too bad so sad. Just Remember: You only need to hit the easiest team for a whole platoon and the Defender picks where hits are applied, not who fails their saves or who dies. What is exactly why I did this. I know its a very common mistake. Roll for hits, grab enough dice to roll saves with out assigning hits, and then pulling dead teams you want off the table. totally changes the dynamic of the game. With putting the different colored dice beside you can clearly keep track of who has been assigned a hit from which weapon. If there is a rule someone would like me to go over, let me know. Using dice as tokens....it's the way to go. It rally makes it a lot easier. one more question: Let's suppose all units were in range. Do I need to assign evenly the hits among the units as I please or there is a certain order of priority? If I have just two teams, can I assign 4 hits to one and 1 hit to the other, or it should be 3 hits to one and 2 to the other? learning a lot to play better! Ya hits have to be applied evenly. So, every team needs a hit before a team can take a 2nd hit. 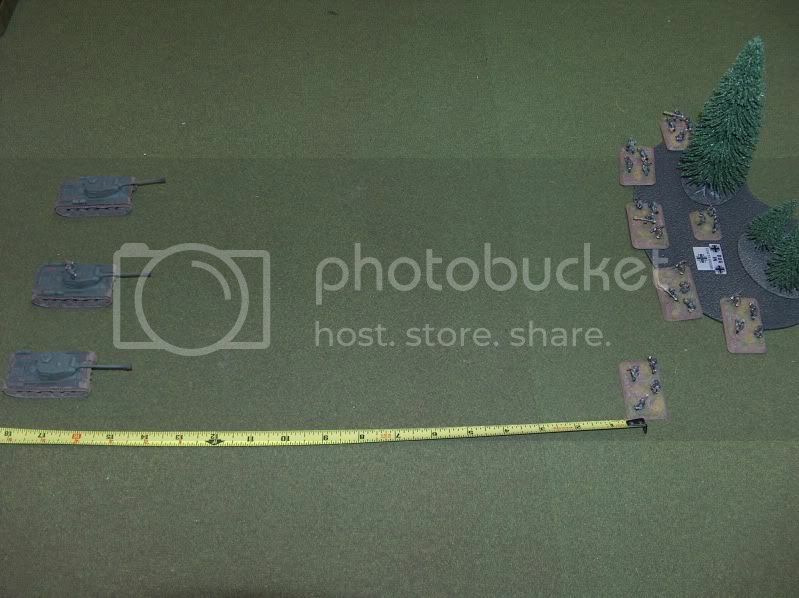 Looking at the photo would the command base the is further into the forest be able to take a hit? Is that stand a valid target since it's in area terrain? How can it be, that a single team has moved and the remaining teams are still dug in and gone to ground?